PowerStation Dimensions: 46" x 27" x 29"
Total Shipping Dimensions: 59" x 32" x 49"
Transfer Switch Weight: 40 lbs. 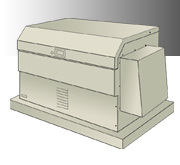 Dimensions: 24"H x 14-1/4"W x 8"
American Generator Co., 240 Circle Drive, Maitland, FL 32751. Tel: 407-628-8186; Fax: 407-628-8919.